LOS ANGELES: Boy or girl, Prince Harry and his American wife Meghan’s first child will be bold and courageous, and Harry will be the more patient parent, according to a US astrologer. 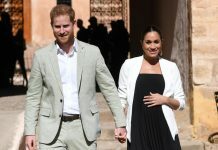 Harry and Meghan, whose official titles are Duke and Duchess of Sussex, have not given an expected due date although Meghan told British well-wishers on a visit in January that she was six months pregnant. The couple said last week they had decided to keep their plans around the baby’s arrival private. Milona, who also reads tarot cards at the Psychic Eye Book Shop in suburban Los Angeles, said that although Meghan was born in August under the zodiac sign Leo, her ascendant at the time of her birth was Cancer. Harry, a Virgo born in September, has Capricorn rising, she said. the sun in her own Leo zodiac sign.